"I was really happy to work with him." Neymar has explained why his former boss Unai Emery will succeed at Arsenal - ahead of Brazil v Uruguay at the Emirates on Friday. Neymar has backed his former manager, Unai Emery, to "bring good things" to Arsenal. 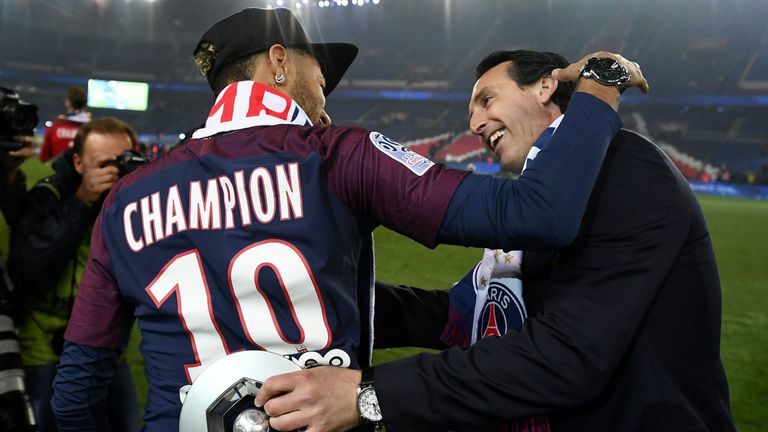 Emery was in charge of Paris Saint-Germain when the club paid a world-record £200m to sign Neymar from Barcelona in 2017. But PSG sacked Emery at the end of Neymar's first season, despite winning France's Ligue 1. Neymar believes he can help Everton forward Richarlison and act as a mentor for his fellow Brazilian. Neymar is part of the Brazil squad who play Uruguay at the Emirates on Friday, where he believes Emery can once again achieve success after replacing Arsene Wenger in the summer. Emery has led Arsenal to a 16-match unbeaten run. "Arsenal are playing really good football, they are in great form," said Neymar. "Everybody knows he is a really great coach. We know about their quality. "I was really happy to work with him because he is a really hard-working guy, he really wants to coach us, he wants to study about football. "He will bring good things for Arsenal, which is a really huge club, a really important club in England. I wish him luck."